With tens of lounge chairs flooding a Google search page and hundreds more inundating the depths of the internet, you may wonder, what makes the Manhattan Home Design Lounge Chair & Ottoman so special? Our Lounge Chair & Ottoman is a reproduction of the Eames creation with an unparalleled attention to details. Using the original Vitra model, our Lounge Chair & Ottoman is an almost exact copy of the original chair and ottoman. With quality leathers and wooden veneers of your choice, our midcentury chair is like no other on the market, well… like no other in not only quality, but price, shipping and more. 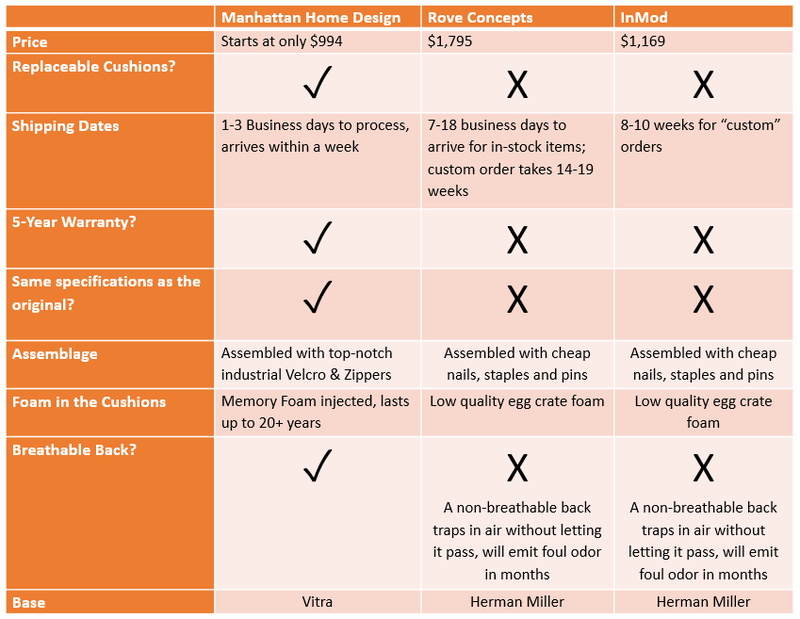 Check out the comparison table below and see for yourself why buying our classic lounge chair is the best choice for you.